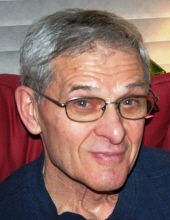 Gene Dennis Perry of Alna, ME passed away unexpectedly at his home on February 8th, 2019. Gene was born in Rumford, ME on November 29th, 1941 to Rene and Delphine (Lindau) Perry. He grew up in Mexico, ME and graduated from Mexico High School in 1960. He received his Bachelor’s Degree from the University of Maine at Farmington and went on to teach at Mexico High School for several years. Gene and Marguerite “Ritie” (Collins) were married on June 20th, 1970. In 1978, Gene began his 32-year career at Bath Iron Works. Upon graduation from the welding apprentice program, he worked in the training department as an apprentice instructor. He later completed the design apprentice program, working as a designer until his retirement. Gene was a proud father and grandfather who enjoyed biking, skiing, camping, hunting and hiking with his family. He and his dog Brownie made many trips together up Mt. Washington. One of his proudest achievements was completing the Trek Across Maine 6 years in a row while in his 70’s, raising funds for the American Lung Association. He was also a passionate New England sports fan. He was predeceased by his parents and his sister, Delphine “Sandra” Martin. He is survived by his wife Marguerite; children Belinda Lee (Jon) Perry Hall, Christopher Gene (Barbara) Perry, and Cory Dennis (Sarah) Perry; his grandchildren, Jonathan, Charlotte, Catherine and Marguerite (Maggie). He is also survived by his brothers Rene (Linda) Perry and William (Geraldine) Perry and his several nieces and nephews. Funeral arrangements have been made by Desmond’s Funeral Home, Bath, ME and Meader & Sons Funeral Home, Rumford, ME. Funeral services will be held at St. Athanasius/St. John’s Church, 126 Maine Avenue, Rumford, ME on Saturday, February 16, 2019 at 12:00 PM. In lieu of flowers, donations may be made in Gene’s memory to the Juvenile Diabetes Research Foundation (JDRF) at JDRF.org. To plant a tree in memory of Gene Dennis Perry, please visit our Tribute Store. "Email Address" would like to share the life celebration of Gene Dennis Perry. Click on the "link" to go to share a favorite memory or leave a condolence message for the family.